All Weather Roofing is a full service provider, we are experienced with installing composition, metal, wood shingles/shakes and all torch down systems. We also install elastomeric systems. All Weather Roofing deals with the largest distributors in the Northwest and is willing to work with you if you have special needs for any type of roofing materials. If our distributors do not carry it, we will find out who does. We are not limited to Malarkey, Pabco, Owens Corning, Gaf/Elk, or Certainteed for our composition installations. 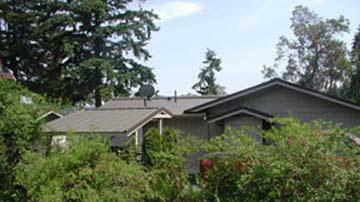 Asphalt Composition Shingles, are practical, last fairly well depending on location. 3-Tab Shingles are protection at an economical price. A metal roof will be the last roof you will ever need to install on your house. Metal roofs are very attractive and come in many colors and styles, their benefits include being low maintenance , superior fire protection, lighter weight. Ideal for lower pitched applications.